We’re having an Art Sale fundraiser! One day only, Saturday November 22nd from 8:30am to 5:00pm at the Ocean Park Hall (1577-128 Street Surrey). We’ll be featuring unique paintings, art pieces, trays, craft items, fabrics, baskets and beaded ornaments, all hand-made by Zimbabwean artists. Get your Christmas shopping done early with these unique gift ideas and stocking stuffers, and make a difference in the world by supporting our worthy cause! Coffee and refreshments will be available. All funds raised will go to supporting widows and orphans in Zimbabwe through the Zimbabwe Gecko Society. Need a last-minute Christmas gift? Why not give the gift that gives back! The Zimbabwe Gecko Society is accepting donations for gifts to those in need in Zimbabwe. 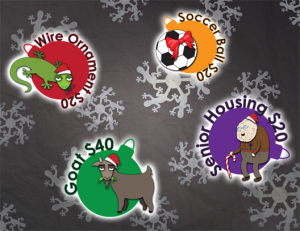 For a minimum donation amount, you can give a family a goat that will provide long-term food and income, give a child a soccer ball that will provide them with a source of fun, give seniors who can no longer support themselves safe and comfortable housing, or receive a wire-beaded ornament which will provide much-needed income for street children in Zimbabwe. They’ll get a gift that will improve their quality of life, you’ll get the satisfaction of knowing you’ve helped another human being during the season of giving. You’ll also receive a card describing your donation that you can give to someone special on your Christmas list! Please contact Susan Janetti to purchase a card, or you can make a donation if you’d like to give a needy person in Zimbabwe a great Christmas. Thank-you to our generous donors who have already made our Christmas Card program a huge success! 8 Christmas Card designs to choose from. 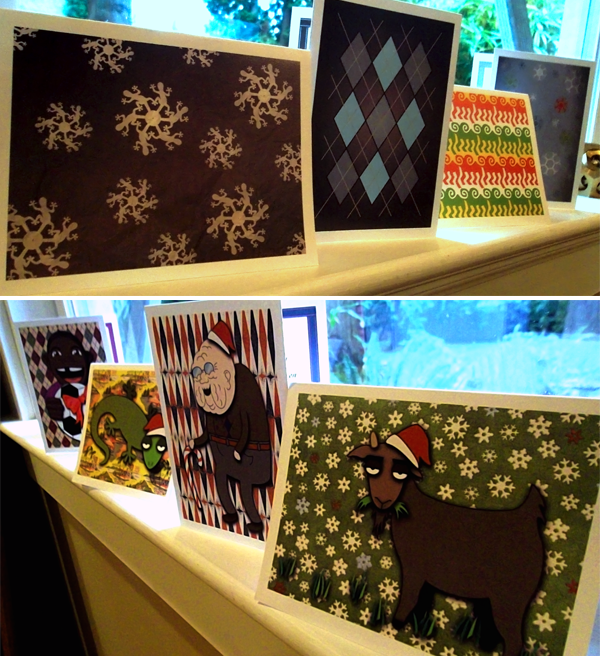 Each gift has either a fun cartoony card or a sophisticated card design so you can match anyone’s taste on your Christmas list. FORT WAYNE, IN – Nine-year-old Emma St. Peters raised $1,180 to help feed Zimbabwean orphans. 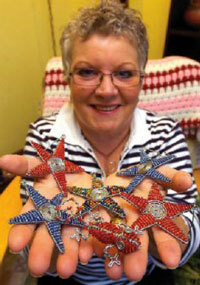 She spoke with community leaders, who agreed to host silent auctions for beaded wire geckos. 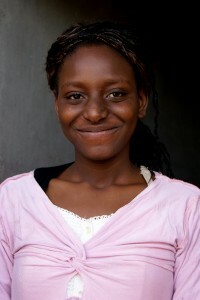 Emma learned from Susan Janetti, director of Zimbabwe Gecko Society, that Zimbabwe’s economic collapse has devastated the usually resourceful orphans. The street kids crafted the geckos from wire and beads and sold them to tourists. Since tourism has dried up, the orphans have no means of earning money to feed themselves. Emma first met the society’s director in Lithuania. Emma’s parents and Mrs. Janetti taught classes at LCC International University. Near the end of the trip, Mrs. Janetti found a gecko in her suitcase and gave it to her young friend. “She immediately connected to the story I told about the orphans,” Mrs. Janetti recalled. “She refused the ‘free’ gift and insisted I take $10 to help feed the children.” Ten U.S. dollars can feed one Zimbabwean child for three months. She sent six geckos home with Emma to sell. Emma and her parents decided to hold a silent auction. She gave a presentation at Trinity Evangelical Church in Fort Wayne, explaining the orphans’ plight and their creative solution. Zimbabwe Gecko Society used the $300 Emma raised from the auction to start a feeding program in Norton, Zimbabwe. The Norton orphanage is home to 200 children. “Lives have been saved as each $200 starts a new feeding program,” said Mrs. Janetti. “Enrollment in a feeding program entitles HIV kids to receive medicine.” ZGS has renamed the Norton program the Emma St. Peters Vana Vanokosha (Children are Precious) Program. Recently Mrs. Janetti returned to Zimbabwe with funds and supplies. She brought several hundred geckos back home and sent some to Emma. Emma spoke with the owner of Old Crowne Coffee Roasters. He allowed her to put up an informational display in the coffee shop. She also gave a follow-up presentation at Trinity Evangelical Church, and she met with a small group Bible study from First Missionary Church. Donors have given between $5 and $350 for the geckos. Direct contact with donors has proven most successful. One woman donated a plane ticket valued around $300 for an alligator. Currently, Emma has geckos for sale at Old Crowne Coffee Roasters. For smaller geckos, sheep, and insects, she is asking for $5 each. For the larger animals, such as giraffes and elephants, she is asking for $15 each. Zimbabwe Gecko Society provides relief to orphans, widows and other people groups affected by the socioeconomic crisis in Zimbabwe. The organization raises funds by selling wire geckos and ornaments made by Zimbabwean children and by hosting an annual African dinner. The funds are used to support programs already running in Zimbabwe and to finance medical missions going into the country. Zimbabwe Gecko Society is based in White Rock, BC, Canada. For more information, visit www.zimbabwegecko.com. Moved by compassion, Sue Janetti helps starving orphans who have lost their parents due to the AIDS epidemic in their former hometown in Zimbabwe. But words can not begin to describe the desperation the Crescent Beach artist is feeling now. Resourceful children on the streets of Harare, Zimbabwe, made hundreds of hand-made wire geckos and ornaments, counting on Janetti to sell them before Christmas so they could have enough money to buy food. Only one problem: The shipment came too late for the festive season. So Janetti is pleading for the public to come to the rescue, as the children are utterly dependent on the profits of these ornaments to buy food.